Some have called quilts made in the 1930’s “depression quilts”. 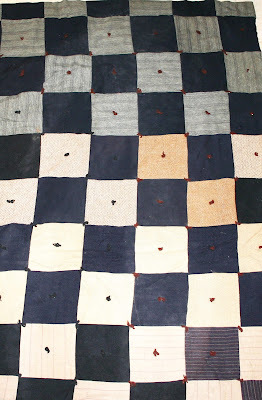 For the most part these were actually bright, cheery pieced quilts constructed from small cotton scraps. One word here, the quilters did not cut up clothing to make their quilts!!!!! Clothing was patched, darned, hemmed and lengthened and handed down when outgrown. 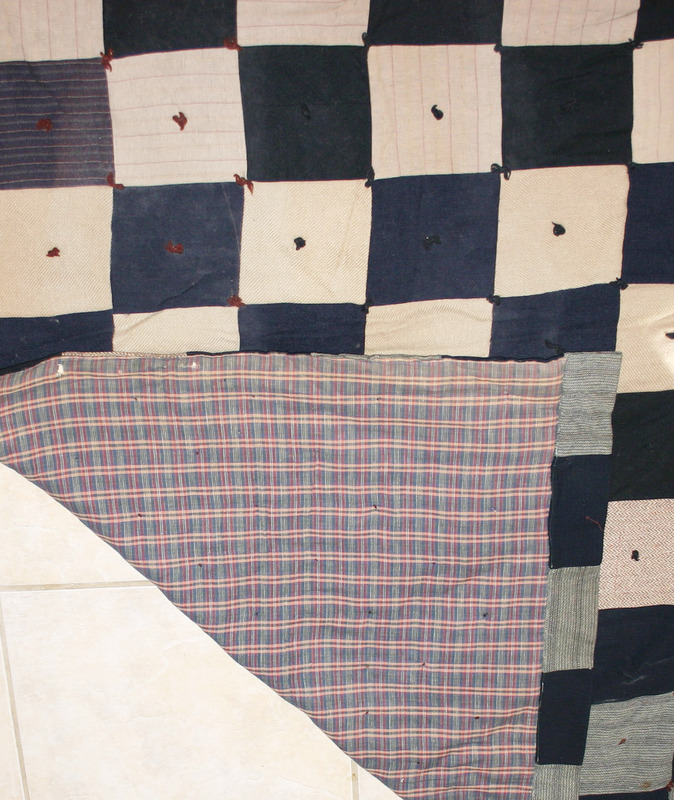 Clothing that was too worn or stained could have been used to make rag rugs, but usually not quilts. 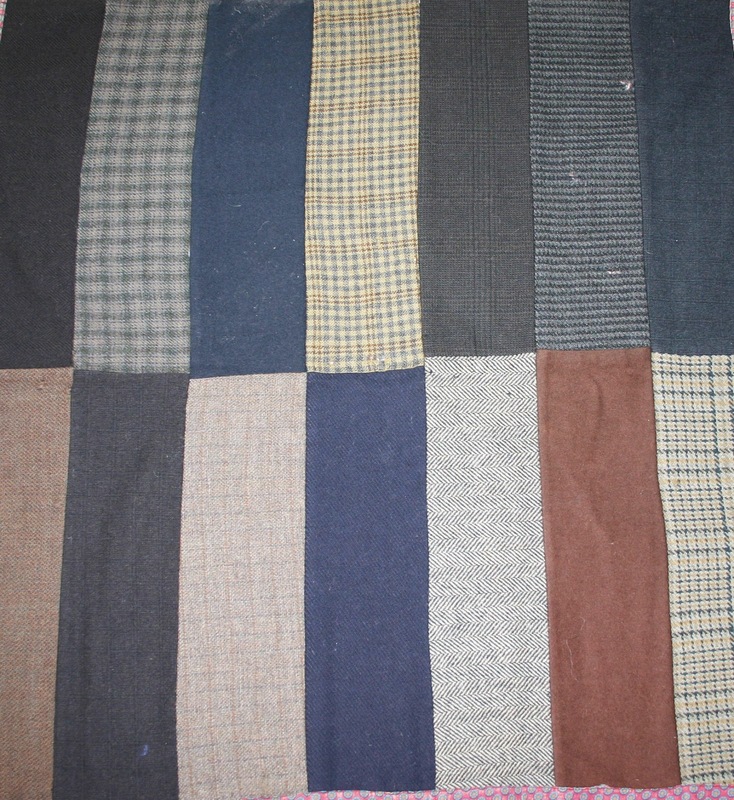 What was used were scraps of cotton fabric left after cutting clothing patterns or curtains. The dress fabric from your sister’s favorite dress that you see in your patchwork quilt was pieces of these leftovers. Often, women would save bags of scraps and then share them so that there was a wide variety of fabrics for piecing. Some of the 1930’s quilts were made from hundreds of very small pieces of cloth. There were contests with prizes for the quilts with the most pieces, or the smallest pieces (some were the size of postage stamps). 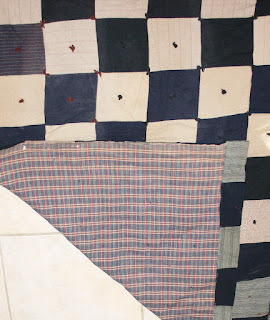 Today I wish to share quilts, or rather bedcovers (these had no middle batting, only a pieced front and backing, usually tied, not quilted) that are not bright, cheery, nor made from small scraps but come from the decades of the Great Depression. While these were not particularly artful, nontheless, they were perfectly suited for a man’s or boy’s bed and were very warm. 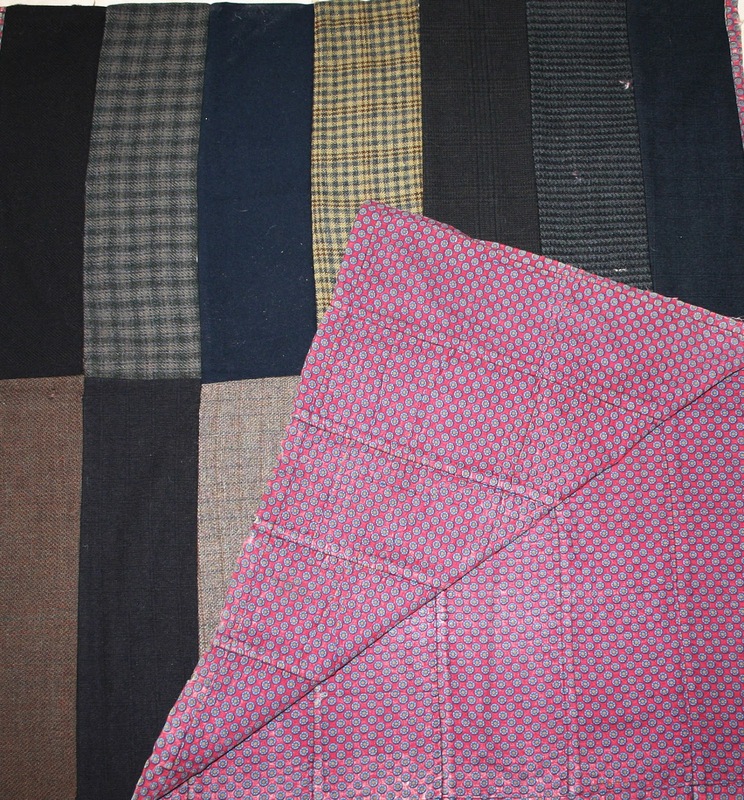 These quilts are made from men’s wool suiting fabrics. Of course, they were not made from men’s suits. Most men had only one suit, if they were lucky, and I cannot imagine any housewife taking a pair of scissors to the garment. Again, they did not cut up clothing to make quilts during this period. Looking carefully at the wool pieces it is apparent that these fabrics were samples from woolen mills. Salesmen would take sample books of swatches to tailors and off-the-rack clothing manufacturers who, in turn, could order yardage. When the mill issued a new line of fabrics in the latest colors and patterns, the old fabrics were retired and new sample books were distributed. 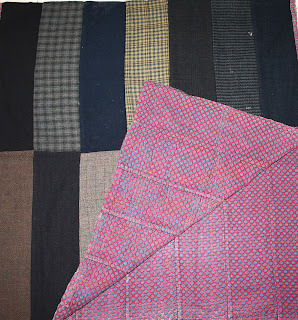 The old samples were perfect for patchwork as they were already cut to a standard size and ready to sew. How fortunate to have a source for these sample books! !